Sittwe, Myanmar/Leda, Bangladesh -- The emergence of Harakah al Yaqin, the first Rohingya Muslim insurgent group to organize in Myanmar in decades, signals a dangerous new phase in a crisis that is increasingly attracting the attention of extremists in Pakistan and the Middle East. Unknown six months ago, the group has ignited a conflict in Rakhine State that has marred Myanmar's transition toward democracy and confronted leader Aung San Suu Kyi with her biggest crisis yet. "Our people have been persecuted for 50 or 60 years, so support for the insurgents is there," said Rahim, a teacher from the village of Dar Gyi Zar, who is among more than 70,000 Rohingya who have fled to Bangladesh since the fighting began. Communal tensions have long-festered in northwestern Rakhine State, where 1.1 million Rohingya Muslims live in apartheid-like conditions, often despised by the Buddhist majority. Serious ethnic clashes erupted in 2012, but the recent violence is the first sign of a Rohingya insurgency entrenching itself inside Rakhine since at least the early 1990s. Reuters spoke to around a dozen Rohingya from villages in the conflict zone about the activities of the group in their area, as well as a police officer who led the interrogations of several captured insurgents and a military intelligence officer. Their accounts, which could not be independently verified, shed new light on how the group prepared for its campaign. They describe how a small group of leaders, including one born to Rohingya parents in Pakistan, recruited several hundred young men, training them clandestinely for months in fields and forests. Mohammed Shah, 26, from Yae Khat Chaung Gwa Son village, was not approached to join the group, but said he was aware of its activities for about six months before it launched its first attacks in October. Once he came across 30 people training in a forest clearing near his village with wooden dummy weapons. "I support them," he said. "We have been persecuted for decades and they are working to bring us justice." On Oct. 9, Harakah al-Yaqin - Arabic for "Faith Movement" - launched three coordinated attacks on separate police border posts, killing nine officers. The group claimed responsibility for the attacks in videos posted online. The security operation launched by the military in response has been beset by allegations of mass killings and gang rapes that the United Nations says may constitute crimes against humanity and ethnic cleansing. The crisis could not come at a worse time for Suu Kyi, who's near year-old government is contending with renewed ethnic insurgencies elsewhere in Myanmar that threaten to undermine the Nobel laureate's signature peace process. 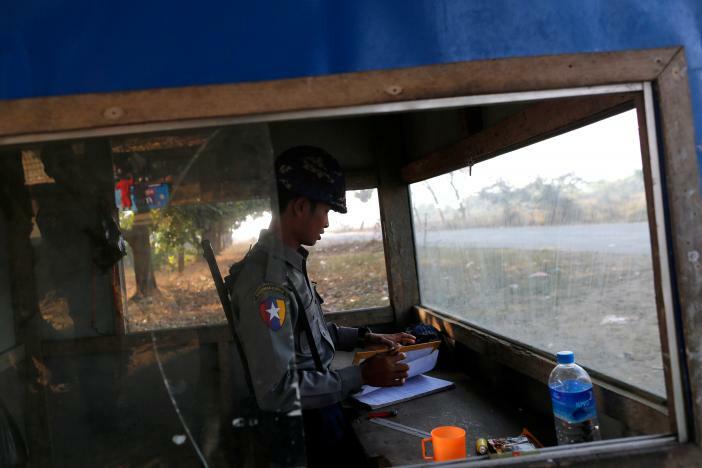 Myanmar's government says the allegations of human rights abuses are "serious", but that security forces are dealing with an insurgency that threatens the region's stability and development. Residents of northern Rakhine and security officials told Reuters that HaY had organized its campaign across the border in Bangladesh, and that it involved leaders with links to Pakistan. In the village of U Shey Kya, adult men were approached in early 2016 and asked to join the group, three residents told Reuters. Some agreed and took part in training, they said. "Some villagers were recruited first, then these agents persuaded other people one-by-one," said one man. "They would go to a grocery store or in the tea shop, they would talk to people." A senior member of HaY, Mohammed Noor, was last month sentenced to death for leading one of the three attacks, the first such verdict to be handed down. Police Captain Yan Naing Latt, the lead interrogator of suspects at the jail in state capital Sittwe, told Reuters the group's goal was to seize control of the northern part of Rakhine to create a "Muslim democratic state for the Rohingya". "There were six cells in total," said Yan Naing Latt, but only three were able to successfully launch attacks. "Leaders like Mohammed Noor were sent with some weapons to each village, recruited and trained locals there." A report from the International Crisis Group in December identified Ata Ullah, a Rohingya believed to have been born in Pakistan and raised in Saudi Arabia, as the leader of HaY. He appears in the videos posted online by HaY, citing Koranic verse and calling for a "jihad" in Rakhine. Rohingya villagers who have seen the videos say the same man was one of those who led recruitment and training. "He used to come to the village very often...he told the villagers that he will fight for our rights," said a school teacher from the village of Kyar Gaung Taung. Four residents said some of the men providing training did not speak the Rohingya language but conversed in Urdu, the language of Pakistan, or English. Refugees and residents said community support for the group was based on frustration with the Myanmar government - which says the Rohingya are interlopers from Bangladesh - rather than religious ideology. Nonetheless, diplomats and analysts say the involvement of foreign militants has the potential to radicalize and enflame the conflict. Myanmar's government has said it believes Ata Ullah and another HaY member, a Pakistani citizen, attended "terrorist training" with the Taliban in Pakistan. While no firm evidence linking HaY to extremist organizations has emerged, several Islamist groups, including al-Qaeda in the Indian Subcontinent, Tehreek-e-Taliban Pakistan, and Islamic State have raised the Rohingya cause in their publicity materials. A senior Myanmar military intelligence officer said HaY has tried to organize resistance since 2013, but was only able to gain a foothold and attract funding in 2015. "They targeted young and educated Muslims and organized several meetings in Bangladesh," said the officer, citing information from informers monitoring the movement of people across the border. The group was still active, the officer said, with the military expecting further attacks. A fresh video surfaced in February showing young, masked men wielding swords and sticks, calling themselves Harakah al-Yaqin. Reuters could not verify the authenticity of the clip. "They are moving from one place to the next and organizing short five- to 10-days-long training sessions in different villages," said the intelligence officer. While that suggests the group is becoming entrenched, the violence its campaign has unleashed has cost it some support. "We're ready to inform the government if the people involved in the training come back," said the U Shey Kya villager.